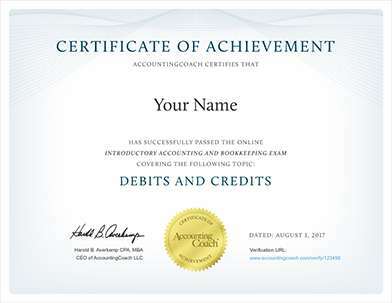 If a company disposes of (sells) a long-term asset for an amount different from its recorded amount in the company's accounting records (its book value), an adjustment must be made to net income on the cash flow statement. For example, let's say a company sells one of its delivery trucks for $3,000. That truck is shown on the company records at its original cost of $20,000 less accumulated depreciation of $18,000. 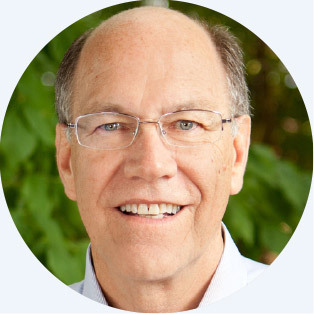 When these two amounts are combined ("netted together") the net amount is known as the book value (or the carrying value) of the asset. In the example, the book value of the truck is $2,000 ($20,000 - $18,000). Because the proceeds from the sale of the truck are $3,000 and the book value is $2,000 the difference of $1,000 is recorded in the account Gain on Sale of Truck—an income statement account. The transaction has the effect of increasing the company's net income. 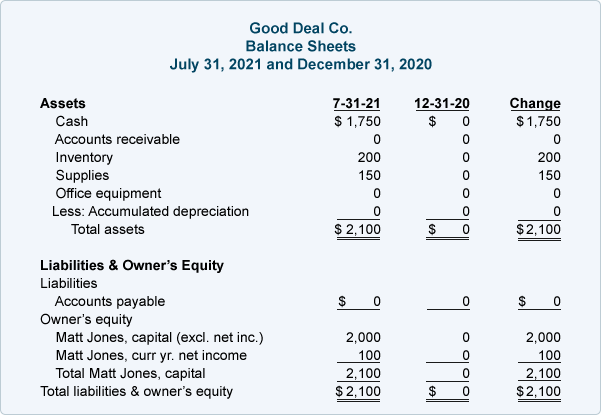 If the truck had sold for $1,500 ($500 less than its $2,000 book value), the difference of $500 would be reported in the account Loss on Sale of Truck and would reduce the company's net income. One of the rules in preparing a statement of cash flows is that the entire proceeds received from the sale of a long-term asset must be reported in the second section of the statement, the investing activities section. This presents a problem because any gain or loss on the sale of an asset is also included in the company's net income which is reported in the first section—operating activities. To avoid double counting, each gain is deducted from net income and each loss is added to net income in the operating activities section of the cash flow statement. Let's illustrate this by returning to Good Deal Co.'s activities. On July 1 Matt decides that his company no longer needs its office equipment. 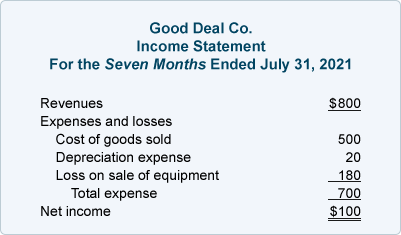 Good Deal used the equipment for one month (May 31 through June 30) and had recorded one month's depreciation of $20. This means the book value of the equipment is $1,080 (the original cost of $1,100 less the $20 of accumulated depreciation). 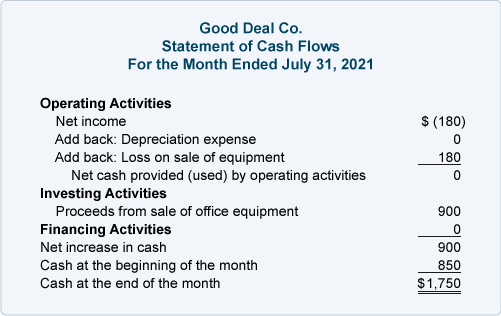 On July 1 Good Deal sells the equipment for $900 in cash and records a loss of $180 in the account Loss on Sale of Equipment on its income statement. There were no other transactions in July. Net income for July was a net loss of $180. There were no revenues, expenses, or gains, but there was an entry of $180 in the account Loss on Sale of Equipment. There was no cash provided or used by operating activities. Good Deal received $900 from the sale of its office equipment. There was no change in long-term liabilities or owner's equity during July (other than the $180 loss on sale of equipment). The summation of the amounts on the cash flow statement is a positive cash inflow of $900. This amount agrees to our check figure—the increase in the Cash account balance from June 30 to July 31. Net income for the seven months is $100. This includes revenues, gains, expenses, and losses. Included in the net income for the seven months is $20 of depreciation expense. This expense reduced net income but did not reduce the Cash account; therefore we add the $20 depreciation expense to the net income. Inventory on July 31 is $200 (4 calculators at a cost of $50 each). Since the company began with no inventory, this increase in the Inventory account means that $200 of cash was used to increase inventory. Supplies increased from none to $150. The increase in the Supplies account is assumed to have had a negative effect of $150 on the Cash account. Combining the amounts so far, we see that the cash from operating activities is a negative $50. In other words, rather than providing cash, the operating activities used $50 of cash. There is cash outflow (or payment) of $1,100 to purchase the office equipment on May 31 and the $900 of cash inflow (or receipt) from the sale of the office equipment on July 1. Combining these two amounts results in the net outflow ("cash used in investing activities") of $200. There was an owner's investment of $2,000 made on January 2. 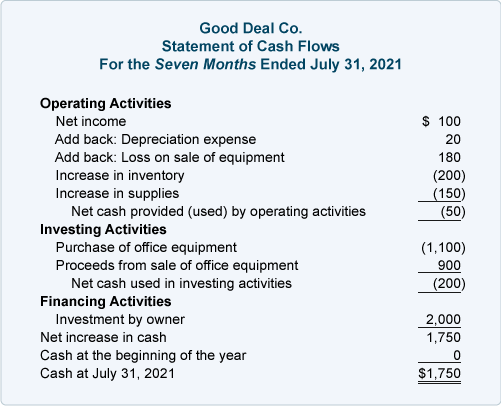 The statement of cash flow's bottom line amount of $1,750 results from combining the amount totals of the previous three sections—operating, investing, and financing activities. This $1,750 agrees to the check figure—the difference in the Cash account balance from the beginning of January to July 31.